Pokemon Go: New Raid Boss Dialga Available Now! Niantic recently released an all new Legendary Pokemon for Raid battles! 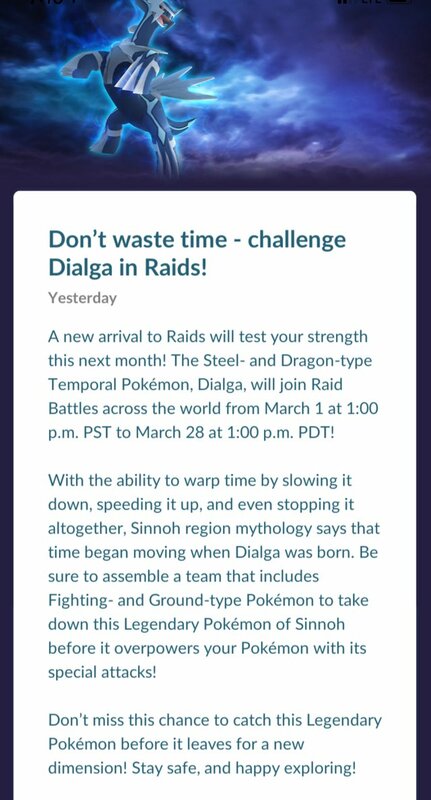 The latest Legendary Raid boss is the Generation Four Pokemon called Dialga. Dialga is a Steel and Dragon type Pokemon. I have to admit that the Legendary Pokemon from the Sinnoh Region are looking great in my opinion. It is considered one of the Temporal Pokemon of the series. I have yet had the chance to battle this but it seems to be more of a challenge to defeat and catch these. Dragonite is actually the best counter for the new the Raid Boss but also seems to be vulnerable to ground type which may bring other favorites out to battle here! Variety is always great to have as most raid groups are very similar in choosing the Pokemons to battle with. I have not had the chance to Raid much as of late as it feels like the community has begun to slowdown in their participation and thus makes it less easy to get groups together. It is probably due to the fact that there is really no additional incentive to do them other than getting a new Pokedex entry. It is always good to get another addition to the Pokedex!